High hopes: For Ons Jabeur. When Ons Jabeur started her 2018 season with a 0-5 record, she probably wasn’t expecting she’d end her year by winning seven matches in seven days to reach her first WTA final – at a Premier-level event no less. The Tunisian history-maker became the first Arab woman to make a WTA semi-final or final thanks to a magic run at the Kremlin Cup in Moscow last month, where she made her way through qualifying and took out three top-eight seeds before falling to Daria Kasatkina in the title decider. It wasn’t just that she was winning but it was the manner in which she was doing so. Jabeur showcased her flamboyant brand of tennis at Moscow’s Olympic stadium and the world finally got to witness what her golden hands can do. From jumping backhands, to conniving slices to the no-look, behind-the-back half volley that earned her the WTA Shot of the Month award, the Jabeur Show was on full display and everyone was eating it up. Even more impressive is the fact that she had that run without her coach Bertrand Perret in her corner due to his three-month suspension for an issue that occurred when he was coaching Peng Shuai last year. 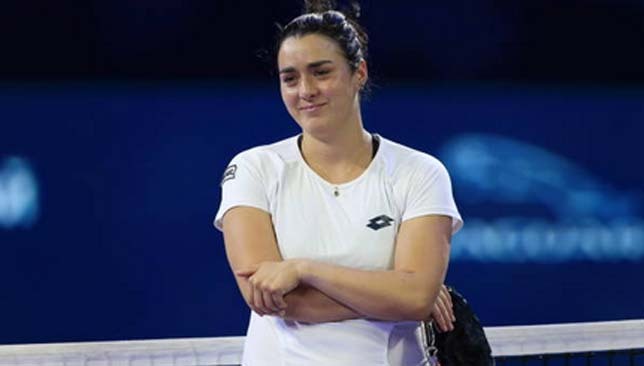 Her season may have ended with a loss to Kasatkina – after leading the Russian 6-2, 4-1 – but Jabeur can take great confidence from her last few months on tour, which saw her reach her current career-high ranking of 61. It is the highest ranking ever achieved by an Arab woman in singles, as she eclipsed her compatriot Selima Sfar, who peaked at 75 in the world in 2001. “I’m really proud of the fact that physically I was ready, I played eight matches [in Moscow], I’m not known as the most athlete that’s really ready for a long run but I proved to everyone that I can be physically ready, that I can beat top-10 players, and I’m really proud of that. I’m really proud of the level I showed,” Jabeur told Sport360. After commencing the year with a 1-9 win-loss mark through the first three months, Jabeur slowly started to find her form, but it wasn’t until the grass season that things really started to look up for the 24-year-old. She won the $100k ITF title in Manchester, which earned her a wildcard into the Wimbledon main draw. At Wimbledon, she became the first Arab woman to win a singles match at the All England Club since Sfar in 2005. “Beginning of this season wasn’t successful for me of course,” admits Jabeur. “But I’ve been hurt a lot and I told myself to be patient and to learn from these bad losses, especially sometimes it was really, really tight. But I think the way that I believed in myself, the way I kept myself patient, and I was able to continue to do the hard work and to be in a good position, especially at the end of the season, and starting from the grass, and a little bit of clay – the fact that I was able to continue working hard without seeing the results paying off, I was able to continue, this is really good. A few weeks after Wimbledon, she reached the quarter-finals of the WTA event in Bucharest, then qualified for the US Open later in the summer. Last month at the Premier Mandatory event in Beijing, Jabeur qualified for the main draw then defeat world No. 1 Simona Halep via retirement in the first round before losing a tight affair to Donna Vekic. It was all just a prelude to a stunning week in Moscow. “I’m really proud, I’ve been waiting for this moment a long time ago, and it’s time to show the world who I am, to show the game I’m trying to play on the court, the fun stuff, to do the fun stuff,” said Jabeur, who has won over a lot of fans globally after her Russian adventure. “I think a lot of people reacted. A lot of people are happy with the way I played, they’re surprised, they didn’t know me, they didn’t know the level that I have. It’s amazing to feel this way, to hear people what they’re saying about me, especially commentators on TV. It wasn’t just Tunisians in cafes who were following Jabeur’s progress in Russia, President Beji Caid Essebsi was also keeping tabs and he congratulated her after the final. “Yes, I got a call from the President of Tunisia, I was really surprised. But it made me feel happy, it made me feel that he cares and he wants me to be one of the greatest players in the world. That’s something amazing and of course to hear from the President of our country is something I’m really proud of,” she says. Kasatkina, now ranked 10 in the world, believes it was important to showcase the entertaining kind of play, which she describes as “not the usual women’s tennis”, from both her and Jabeur in the Moscow final. The 21-year-old Russian has spent several offseasons training with Jabeur in Slovakia, and is not surprised by the level she displayed at the Kremlin Cup. Joined by Perret, and her husband and fitness coach Karim Kamoun, Jabeur has already started her 2019 preseason preparations as she looks to start next year far better than how she began this one. Her higher ranking means she can get into most tournaments directly and she has a few months early in the year where she can pick up some serious points. “My goal is to enter the top-30, I’m not that far. But that’s just a number, for me it’s to keep improving my game, to keep improving my level,” she asserts. 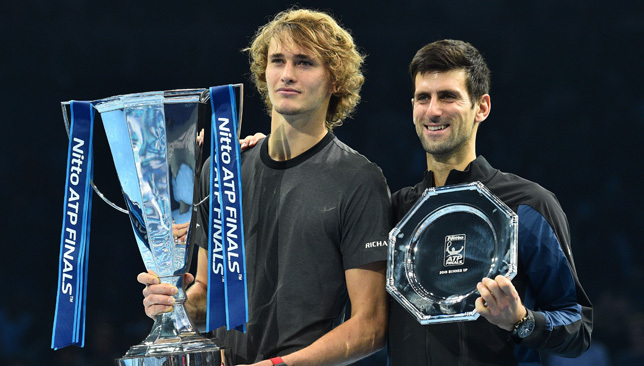 Alexander Zverev denied Novak Djokovic a record-equaling sixth ATP Finals title by producing some impressive tennis to stun the Serb 6-4, 6-3 and become the youngest player to lift the trophy since his opponent won it in 2008. The 21-year-old Zverev, who had lost to Djokovic easily just four days earlier in the round robin stage, followed up his victory over Roger Federer in the semi-finals with success in Sunday’s championship match, to become the first German since Boris Becker in 1995 to win the ATP Finals. A day after getting booed by the O2 Arena crowd for stopping play in the second-set tiebreak against Federer when a ball kid accidentally dropped a ball onto the court, Zverev showcased precisely why he is being described as the future of tennis, handing an in-form Djokovic just his third defeat in his last 38 matches. Those three defeats Djokovic suffered came against Stefanos Tsitsipas (Toronto), Karen Khachanov (Paris Masters) and now Zverev – players who are all aged 22 and under. It is the latest sign that a changing of the guard could be just around the corner, and Zverev’s triumph, witnessed by a marquee audience that included the likes of David Beckham and Guga Kuerten, was a fitting finale to a transitional 2018 season. “Right now I really can’t describe it. I’m unbelievably happy, this is obviously the biggest title I’ve ever won,” said Zverev during the trophy ceremony. “First of all I’d like to congratulate Novak on a great week again, not only this week but you know how you played the second half of the year, we maybe never seen it before, you barely lost a match and I’m actually very thankful that you lost one to me today. “We played twice this week, everybody knows how good of a tennis player you are but I want to really mention how good of a person you are as well. We had so many talks, not only about tennis, but about other stuff, about life, about all different kinds of subjects, I’m not going to mention the ones we talked about, but yeah, you’re also a very good sharer of this world. Entering the final, Djokovic hadn’t dropped serve in any of his 36 service games through the five matches he played. He had only faced two break points en route to the final both of which came against Zverev in the round robin stage. Serve reigned supreme through the first eight games, with both players barely dropping points on their own serve. But Zverev found an opening in game nine, creating the first break point of the match, and he converted on a netted forehand from Djokovic. It was the first time the world No. 1 was broken all tournament. Serving for the set at 5-4, Zverev, who led the tournament with 42 aces entering the final, aced three times and wrapped up the set on his second opportunity in 39 minutes. The world No. 4 won a 26-shot rally to get a break point in Djokovic’s first service game of the second set. The top seed saved it but soon faced another and this time, Zverev did not flinch, out-rallying Djokovic and breaking with a brilliant forehand winner. Djokovic pegged him back immediately for 1-1 but Zverev struck again to take the lead. The break-fest was finally halted by Zverev, who opened up a 3-1 lead and he maintained his advantage throughout the second set. He secured an exceptional victory against a seemingly invincible Djokovic with a passing shot winner he won’t forget anytime soon. An emotional Zverev fell to the ground in disbelief and Djokovic walked over to his side of the court to congratulate him. As the pair embraced, one couldn’t help but feel that moment could end up bearing deeper significance down the road, as Zverev became the youngest to win this title since Djokovic achieved that feat 10 years ago. It was like a torch had been passed on from one generation to the other, even though Djokovic remains No. 1 in the world and has won the last two majors. “There’s a lot of similarities in terms of trajectory of professional tennis, in our careers. Hopefully he can surpass me. I sincerely wish him that. He seems like someone that is very dedicated. Without a doubt, he’s a really nice person, someone that gets along very well with everyone,” said Djokovic of Zverev. 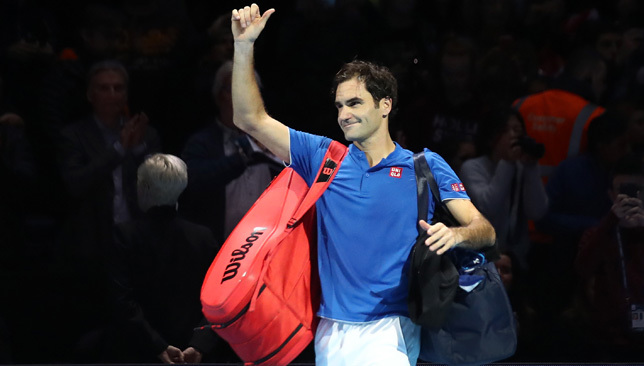 Roger Federer is “proud” of his 2018 and confirmed he will be competing next season, albeit admitting he has lots of decisions to make regarding his schedule. The Swiss, who bowed out of the ATP Finals with a defeat to Alexander Zverev in the semis on Saturday, claimed four titles this year, including a 20th Grand Slam trophy. He also managed to return to the world No. 1 spot in February, and held it for eight weeks in total this season. “Sampras once upon a time said, ‘If you win a Slam, it’s a good season’. So started great. I played super well in Australia again. So obviously I can’t wait to go back there in a couple of months,” Federer said, reflecting on his 2018. He ends the year as the world No. 3. Asked if five years ago he would have signed up for a season like this at the age of 37, Federer said: “Yeah, I probably would have. I must tell you I’m very proud that at 37 I’m still so competitive and so happy playing tennis. From that standpoint, I mean, as disappointed as I might be about this match, if I take a step back, I’m actually very happy about the season. “It’s been a historic season in some ways. Got back to world No. 1. For me, that was a huge moment in my life, to be honest, in my career because I never thought I would get there again. “Five years ago, where was I? I was probably fighting with back pain in ’13, not sure if I was ever going to figure that back pain out again because I had it for almost probably four or five months of the season. It really rocked my tennis for a bit. Federer had some close losses this year, but when pressed to pick a point he’d like to replay from those tight defeats, he told Swiss press he would choose the match point he squandered against Kevin Anderson in the Wimbledon quarter-finals, and the ones he held against Juan Martin del Potro in the Indian Wells final. Looking ahead to next season, Federer knows a lot of decisions need to be made regarding his schedule, his preparations and everything in between. “I think we’re eager to see what we’re going to work on exactly. Also what’s the decision on the clay, seeing what’s going to transpire through the vacation, what is my thoughts, all that, then taking the decision at some point in next few weeks on that,” said Federer.